Further to my previous blog post Administration in crisis the ‘debate’ and vote was taken again at Thursday’s (23rd April) meeting of the full council, on the Corporate Performance Management – 2015/6 (basically the targets that the council sets itself for the forthcoming year). Southend Council, like many other local authorities aspires to have 100% of its children going to schools that Ofsted deem to be Good or Outstanding (indeed that is the stated ambition of the ‘Southend Challenge’). However, we have to be practical. Therefore we set targets for the forthcoming year. This Administration decided that they wanted to set one target – amalgamated for all schools. I have no problem with this, although it can mask problems in one sector of our schools much more easily than if you have separate targets. The important thing is that the targets are amalgamated correctly. Now, fortunately for the residents of Southend, I have the ability to add up and divide, an ability that appears to have escaped both the current portfolio holder for education and the Leader of the Council (we all know about ‘Woodley Maths’ and how it costs us money). Looking at the table above, and appropriately weighting the figures (by taking into account the number of children at each type of school), to set the new target for 2015/16 at the same level as the three targets for 2014/5, it should be set at 79%. The most recent Monthly Performance Report shows that our schools are currently achieving 77%. So they have set it at 75%. What is rather more sinister is they have compared it to ‘n/a’ for last year. Whilst, strictly speaking, there wasn’t a target for all schools last year (there were three, as above), in the spirit of showing whether targets were going up, down or staying the same, this is rather naughty (as I could do the maths on the back of the preverbal fag packet). Gives rather a different perspective, don’t you think? The difference between 79% and 75% might not sound like much, but in fact it is setting a target that says we, as your elected representatives are prepared to accept 1,154 less children going to a Good or Outstanding school, whilst still giving the current Administration a pat on the back. Put another way, when we walked into the council chamber the council was not hitting its target. When we left it was exceeding its target. All the town’s teachers and kids were at home… so I’m not sure much could have changed other than reducing the target! I challenged the current Administration on these targets, both at the People’s Scrutiny Committee (a couple of weeks ago) and at the council meeting on Thursday. Instead of accepting that they had made a mistake (something better Administrations than them were prepared to do when it happened), we all do occasionally, I was berated by the deputy portfolio holder who decided to tell me that because he’d got his MBE for education he knew what he was talking about. I was content for him to answer on behalf of the Administration purely because the Leader had appointed him as the deputy portfolio holder and Cllr Anne Jones was absent again – I have not had a chance to put these matters to her at either scrutiny or full council, something I find most unsatisfactory, informed that my language was too emotive (this new target is pathetic – you don’t set yourself a target BELOW what you are already achieving- if you want to improve education for the children of this town). I was also informed by the one Labour member who didn’t have a clue what she was talking about that if we rejected the paper these targets were set in, we’d have more crime and less affordable homes – what a load of rubbish, I don’t think criminals start working and builders down tools because the council hasn’t set its targets for another six weeks. Politics was being played here. The watering down of this target was buried in the council’s overall Corporate Performance Management paper for 2015/16. I was accused of slagging off the town’s teachers (errum, I think not, I was just saying the council was setting itself too low a target!) and that targets didn’t matter, and I was putting too much stress on schools (this is a council target not a school one). If you set a target too low, you make it easy for those working for the council to claim that the job is done. How can the councillors and Chief Executive crack the whip on the education department, when those officers can (quite rightly) turn round and say ‘well we are exceeding the targets you set us’… The simple answer is they can’t. and others who had so viciously attacked me, time and time again, for education standards in Southend (at a time when they were improving rapidly) vote in favour of reducing the target. Fortunately I demanded a named vote so we have it recorded in the annals of history which councillors voted for a pathetically low target, that we are already exceeding and failed our children, just to keep a bit of face for the current Administration. Talking to several members after the meeting, it was disappointing that they all said they agreed with me and that the target was too low, but they couldn’t let the Administration lose the vote. It was noteworthy that at no time did the Leader of the Council accept or propose a minor amendment to the paper to increase the target, which would then have allowed it to go through unopposed. I even hear that, privately, council officers admit they set the target too low – well that’s alright then is it?! If you think the Nigel Holdcroft and the Conservative Cabinet used to have a tight grip on what was happening in the council, you ain’t seen nothing yet. Ron Woodley and his band of merry men are prepared to do anything to not lose face. I have never been more angry and disappointed in my political life and I was embarrassed to be a member of your council that night as, collectively, we failed you. At tonight’s People’s Scrutiny Committee we debated the Corporate Priorities and targets for 2015/16. For background, once a year the Administration has to set it’s priorities and targets for the forthcoming year. They basically say what they are prioritising and what they deem to be acceptable targets for the council to achieve in a number of areas. This year, some of the targets are so weak, that a paper that usually goes through without challenge, just had to be questioned. And question it I did! The portfolio holder for Children and Learning being unavoidably absent (get well soon Anne! ), I was unable to ask some of the questions I wanted to, but nevertheless the responses I got regarding our targets being so weak for our young people in Southend were not good enough. Therefore I decided that Cabinet needed to think again. Fortunately two members of the Independent Party, forming the lion’s share of the Administration, decided to vote with me and my fellow Conservatives and asked the Administration to think again. It is also noteworthy that no Lib Dem voted in support of their Administration. I’m not sure what the two Labour members did, I think they were too busy being directed by their quick thinking Group Leader from the other side of the room, to ensure that the Administration did not lose the vote on something that can only be considered one step in importance down from getting their budget passed. He failed, and lose the vote they did, badly, but he managed to ensure his two members (completely independently minded and not whipped at all – honest guv!) referred the matter up to the full council to try and save the day. I’m sure before next Thursday Ron Woodley will bully his dissenting Party members into voting for his Administration. Perhaps if, instead of moaning about the previous Administration and setting weak, easy to achieve targets, they set themselves robust challenging targets, like the Conservatives always used to, Ron Woodley and his gang of misfits wouldn’t find themselves in this position and be able to carry themselves and their backbench members through a pretty important vote! 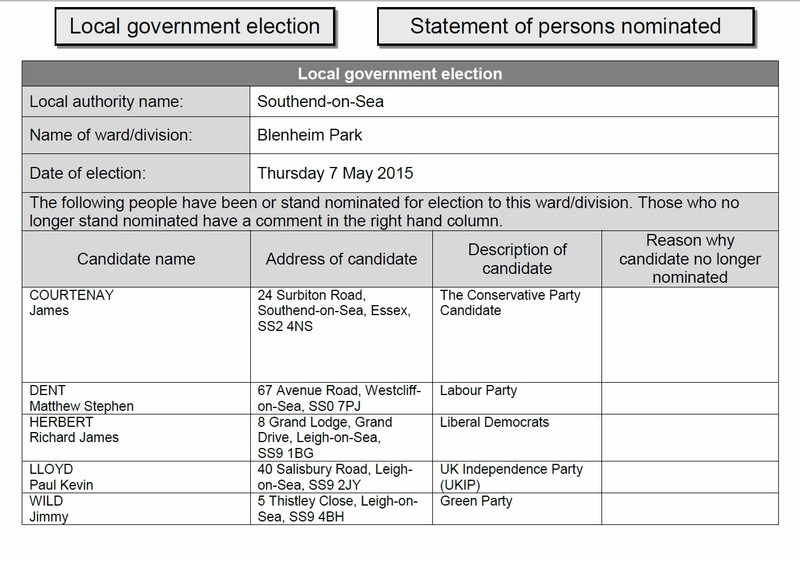 There are five candidates in the forthcoming local election in Blenheim Park. Three of us (Conservative, Labour and Lib Dem) have already been active and delivered election literature. I have also been out knocking on doors speaking to residents and carrying on my efforts of the last four and a bit years to help residents achieve the changes they want in the community. I suspect the other two candidates activities will remain as active as they have been already. Sadly I suspect one of these two will finish in the top two, without delivering any literature whatsoever. I just hope it is in number two spot, behind me. Only time will tell! Back in December 2014 I presented a petition to the full council of 277 parents, carers and staff of Darlinghurst Primary School, requesting that the Council enforced the school keep clear markings and provide a School Crossing Patrol Officer at Pavilion Drive. This evening Traffic and Parking Committee met to consider the Council’s report into the petition. The report recommended that no lollipop person was provided. I thought it was a forlorn hope. However I am delighted to report that I managed to persuade members of the committee that there are exceptional circumstances and therefore a lollipop person will be funded by the council. The children of Blenheim Park will be safer because of this decision. It took me over half an hour to persuade my colleagues to go against the officers’ recommendation, but – SUCCESS!! Attached is the latest Thorpe missive from Council Leader Ron Woodley. He has decreased borrowing by £10m? Errum, no he hasn’t, the council finance team has delayed borrowing money for a little while, due to prudent financial management. Reduced planned debt, reduced costs, but kept care homes open, put money into the pier, A127, cliff slip etc etc etc…. oh and gold plated the loos in his ward. Errum… Woodley maths, something I’ve reported on a few times before, is needed here. You can’t cut spending and borrowing, whilst increasing spending. Hence the lies in this leaflet. Borrowing has been INCREASED in 2015/16 and beyond over and above what the previous Conservative Administration planned. Grammar schools – he fails to mention that in 2014 there was over a 25% increase in the number of Southend children going to the town’s four grammar schools. Funny that as it was yours truly responsible for education at the time… This increase has continued into 2015 admissions. That’s all well and good but unless the Leader of the Council is offering to go around and pick up everyone’s white sacks when they have filled them, I’m not quite sure what the point is of delivering them to residents. It was HIS administration that scrapped white sack collections only a couple of weeks ago. It was the Conservatives who tried to stop it, but due to votes on party lines and support from those UKIP who could be bothered to turn up and stay to vote the proposal to keep the textile doorstep recycling service (white sacks to you and me) was ‘black sacked’. Still Ron Woodley is only the Leader of the Council, what should he know about what budget he proposed and took through the council chamber? Following on from the Independent, Labour and Liberal Administration’s change of heart, under significant Conservative pressure, with toilets (see my earlier post Loodicrous proposals scrapped), there are still a fair few things that need to be sorted out with this budget! Click on the links above for further details. I will say much, much more on all of these amendments on Thursday, when the Council meets to discuss and set next year’s budget. There are a number of other proposals we are not happy with – personally I am particularly shocked at Anne Jones’ (Labour, Executive Councillor for Children and Learning) proposals to cut £95,000 from the School Improvement Budget and taking £100,000 out from the town’s Children’s Centres budget, but there is a limit to what you can do in opposition. Sadly the damage the Administration can do, in only one year, seems almost endless. Well it is a fact that car parking income makes up a considerable park of the Council’s income. Therefore it can’t just be cut without having an impact upon services. However with places like Bluewater and Lakeside not far away, where parking is free, I think it is important to keep car parking charges as low as possible. This is why the previous Conservative Administration froze car parking charges for five out of its last six years. The person making that statement? Council Leader Ron Woodley, who’s budget it proposing to increase parking charges by HALF A MILLION POUNDS in one year. Yes HALF A MILLION POUNDS to be taken from residents and visitors to the town alike. That is half a million pounds not going through the tills of our local businesses, be they on Southend High Street, Hamlet Court Road, Leigh Broadway or even Thorpe Bay. Parking near Southend High Street could cost you 20% more in April than it does now. Ouch. What has the Independent, Labour and Liberal Administration chosen to do with this extra £500k? Have they decided to cut our Council Tax? Nope that’s going up too. No, they have decided to spend half of it on offering free car parking from 6pm (just as all the shops on the high street shut) on the seafront all year around. The rest? Well this year it is going to be spent on doing up some toilets in Thorpe Bay ward. No points for guessing which ward Ron Woodley represents and is up for election in this year…. The Administration’s proposals to save £40,000 by closing a number of toilets in multiple locations across the town (Shoebury, Southchurch and Westcliff) with the exception of Thorpe Bay where, perhaps unsurprisingly, the Leader of the Council Ron Woodley and the Portfolio Holder for toilets Martin Terry live/represent were ill thought through, so much so that Terry decided to blame his officers rather than carry the can himself! 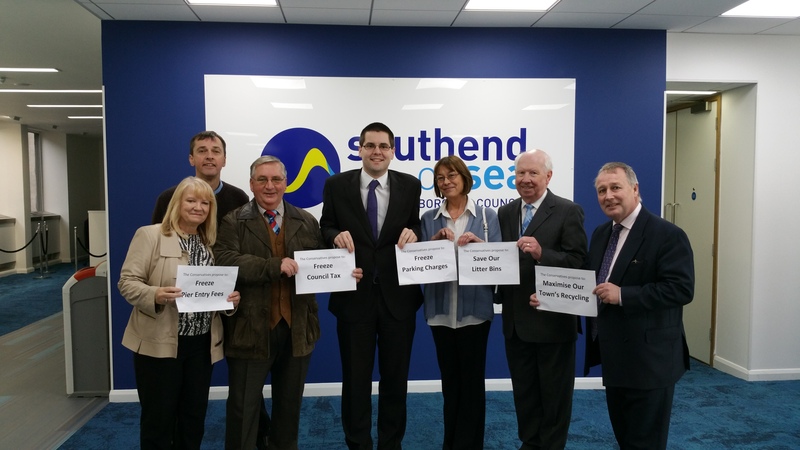 To propose closing toilets hardly sends the message that Southend is open for business or pleasure. Southend is a popular destination, not only the seafront for tourists and residents during the summer, but also for our shopping venues such as Hamlet Court and Southchurch Road. To propose closing toilets whilst proposing to spend £190,000 (or £15,000 a year through borrowing costs – which was 40% of the total proposed saving from all the other toilets put together) to do up one set of toilets which, perhaps unsurprisingly again, are in Woodley and Terry’s Thorpe (Bay) ward is just loodicrous! As Nigel Holdcroft reports, Southend’s Conservatives, councillors, ex-councillors and general activists worked together to with residents of the town to oppose this proposal and the Administration has changed its mind, rather than risk losing a vote on the matter, as we Conservatives would not have taken this lying down. So whilst you have to pay more to live in Southend, pay more to park at the seafront, at least you’ll be able to spend the last penny you have left! Last night was the first opportunity I had to question Cllr Ron Woodley on his claim that he was reducing borrowing by £38m, thereby saving £2m a year in outgoings. I pointed out to him, that his draft budget papers showed an INCREASE in borrowing, over and above what the previous budget (and Administration) had proposed, of some £5.8m next year (15/16) and £9.6m over the next four years or so (15/16 – 18/19 ‘and later years’). This is some £17.7m MORE than the previous Administration proposed. Things are never quite as simple as they look, and the Council can borrow from itself (spending short term surplus cash it has) – and who wouldn’t… but at the end of the day the Council will need that money and therefore have to borrow it. But, even making allowances for this (£10.3m ‘internal borrowing’), the proposed borrowing is going up by over £7m. For the eagle eyed of you, the reason for the difference to the £9.6m is, I believe, mainly because of the underspend in the 2014/15 budget. Now, I, like the previous Leader of the Council, had no objection to borrowing – it just isn’t sensible for the Council to fund something the town will get a return from over the next 25 years in one year’s budget. But neither he nor I stood in the Council Chamber or distributed leaflets suggesting borrowing was too high, out of control, and that he wouldn’t borrow any more. There was even the suggestion of saving up for projects before starting them. Well that idea seems to have disappeared rather quickly! Anyway, last night I asked him to explain how the paperwork that shows increased borrowings of £9.6m equates to his decreased borrowings of £38m. When I asked him to answer the question, rather than try and be personal, his second ‘answer’ was to reel off what the additional borrowings would pay for. Well, I can read and that wasn’t what I’d asked him. So I tried again. The third ‘answer’ included telling me that I didn’t understand (quite clearly that’s why I was asking!!) and that he had explained it. It was noteworthy that the council’s chief financial officer kept schtum during these questions. So I have had no answer to what I feel is quite a simple question. Cllr Ron Woodley is either wilfully misleading residents of the town or he is incompetent. I suspect it is the latter, but it would be nice to know! His budget includes increased council tax, increased charges, increased borrowings and service cuts…. and he once had the audacity to tell me he was “the only true Conservative in the [Council] Chamber”.